Velingrad is situated in the Northwestern part of the Rhodopa Mountain. It is among the most famous balneological resorts in Bulgaria - 78 hot mineral water springs, unique in their mineral contents. 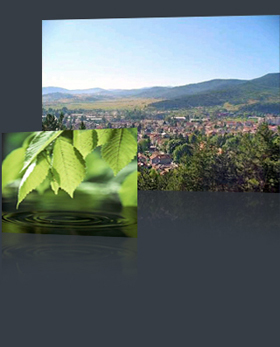 Situated in the picturesque Chepino valley, among roundabout venerable oaks and pine-trees, Velingrad is the most popular place for rest and medication in Bulgaria. It is also famous for its perfect climate - mild winter and cool summer. Velingrad boasts the greatest number of sunny days throughout the year - about 300. In winter, the conditions for skiing are wonderful. • Building-up potential of the plot - 30,000 sq. m.
The project will be developed on a land plot of approximately 120,000 sq. m. strategically located only a couple of minutes walk from the pedestrian and trade area in the very heart of Velingrad. Copyright © 2008 AGP Group. Designed and Powered by BroksVision Ltd.